Hello everyone! I've made a small video about making a miniature porcelain doll and decided to show it here in my thread Maybe it will be enteresting for you to look at the whole process. 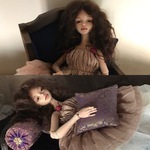 Today I present a couple of my new miniature dolls! They are Mei and Kelly, 6 inches. Ooo I like Kelly! And not just because that's my name I still can't get over how tiny they are in your hands. What an amazing college of achievements for 2017, I'm looking forward to seeing what 2018 holds. Porcelain, china paints. Size-34 cm. Removable magnetic mohair wig. The girl wears a dress made of natural silk, shoes on a hard base, covered with genuine leather and an accessory for hair in the form of silk flowers. More pics as always you can see at my Flickr page! Lena, she is absolutely stunning. Love her big, dreamy eyes. You always manage to give a little bit of your soul to your dolls. It is amazing! ivdolls Thank you very much!^_^ I really try it every time! I love her expression- gorgeous! !